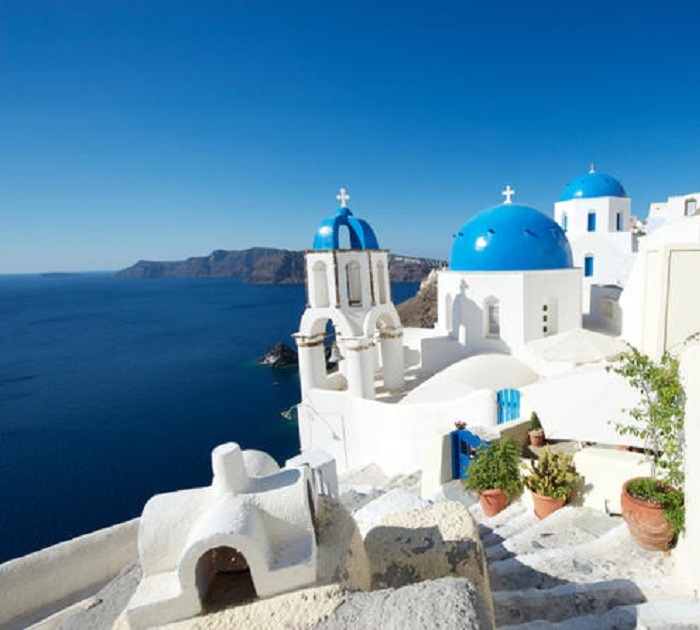 The islands are the main characteristic of Greece’s morphology and an integral part of the country’s culture and tradition. Corfu (Kerkyra or Korfoe or Corfoe). Corfu is a beautiful Greek island in the Ionian sea You can come here by airplane, but also easily by car and boat, via Italy. We did it both, we once came by plane and twice we came by car and boat! Both options are worth repeating. When approaching Corfu by boat, we saw that the island is very green, everywhere are many trees that reach to the sea. The picturesque villages on the coast, surrounded by green trees, give the island an enchanting appearance. 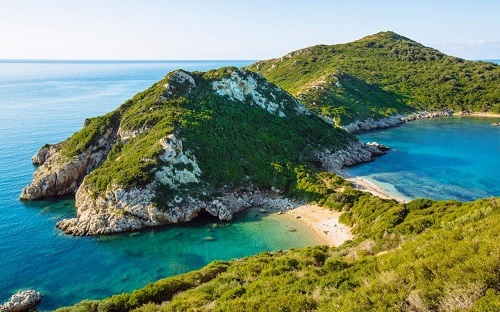 On Corfu is in fact much to see and to do, is advisable rent a car and drive around the beautiful countryside, along the fantastic beaches, through the wooded mountains and the scenic villeages. Concerning Corfu town; Corfu town is incredible, it is one of the nicest and most beautiful towns in Greece. There are beautiful forts, houses in Venetian style, impressive squares, narrow alleys and terraces, the impressions you have are unbelievable. When you are on Corfu, don’t forget to visit the Achillion Palce of Princess Sissi and Kanoni,, a place which overlooks the most picturesquely situated church of Corfu and the mouse island (Pontikonisi). Ithaca. Ithaca is one of the Ionian Islands, it is located to the south of the island Lefkada (Lefkas) in the northeast of Cephalonia. The capital of this elongated island covers an area of 96 sq.km., the population of the island is 3,000 inhabitants, the capital is Vathy. The island has gathered its name from Ithacos who was the first resident of the island. The name of the island is known since antiquity, it was mentioned in the Odyssey. Ithaca is blessed with a beautiful coast with many bays and capes. Very beautiful is the bay of Frikes. The most northern cape of the island is Cape Melissa, while the southernmost cape Agios Andreas is. The length of the coastline is about 100 km. The peak of Nirito Mountain is on 806 meters altitude and Merovigli on 669 meters. One of the characteristic of the island is the barren land and the scarcity of water, which is like a stumbling stone for the progress of agriculture. The island is economically mainly braced by tourism and fishery. Cephalonia (Kefalonia). 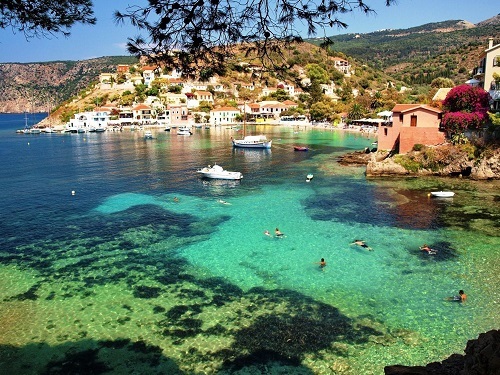 Cephalonia is one of the Greek islands which in recent years, became extremely popular among holiday goers. We visited Cephalonia and found it a great island! Cephalonia is the largest of the Ionian Islands and covers an area of 782 sq. kilometres. The coastline has a length of 254 kilometres. Cephalonia is a wonderful island to visit, all you need to have a successful holiday, you ‘ll find it here: beautiful beaches, magnificent mountains, charming traditional villages, beautiful cities, unique natural phenomena, good food, a rich history. Cephalonia is full of it! Argostoli is the port and capital of Cephalonia, in the centre of the town are lots of cozy restaurants, cafes, pubs and bars. There is delicious food and in the evening it is nice strolling along the boulevard. A very popular seaside resort is Fiskardo, all in the north, in the middle of a beautiful nature and where you have a wonderful view from the lighthouse over the sea. Sami is another popular place, which is best known for shooting the movie Captain Correlis Mandolin. 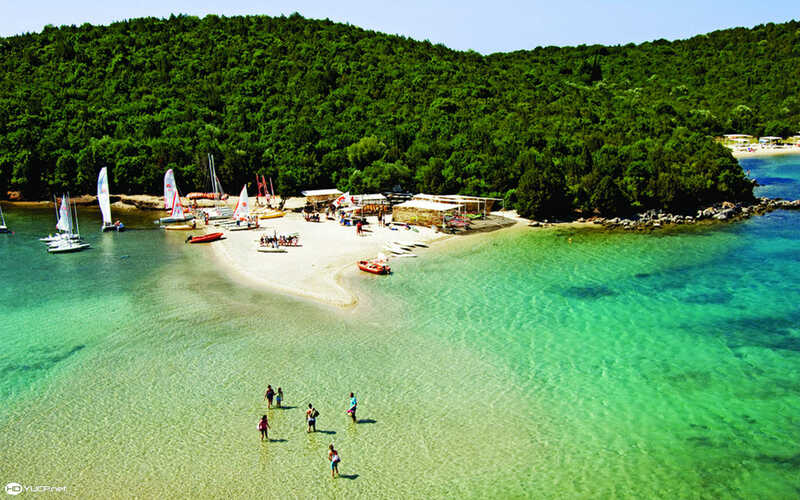 Near Sami is the beautiful sandy beach of Antisamos, the Agrilia Monastery, the Drogarati cave and Melissani cave. From Sami you can boat to the island of Ithaca, several times a day boats sail to the island of "Odysseus". The village of Assos is maybe the most beautiful village of the island, it is built amphitheatrically on the homonymous peninsula. 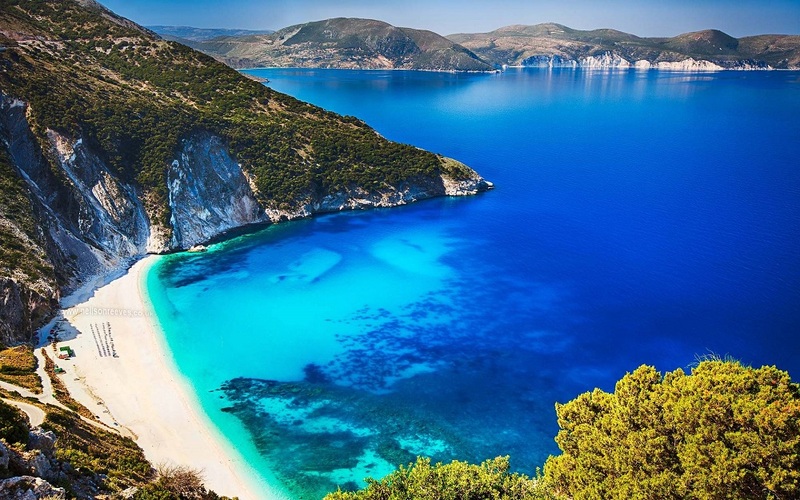 South of Assos lies Myrtos, one of the most famous beaches of Greece, also called the paradise of Cephalonia. It is a stunning white pebbled beach with a deep blue sea at the foot of a steep green hillside. On the peninsula of Paliki is Lixouri located, the second largest town of Cephalonia. On the southern coast of Paliki, there is Xi-beach, a long beach with fine red sand. Other nice places are Poros, Skala, Lassi, Agia Efimia and many more. Lefkada (Lefkas). Lefkada owes its name to the white beaches and the white cliffs at Cape Lefkatas. The island has one of the best road networks of the Greek islands and has well-organized (Yachting) port with facilities for tourist boat traffic. The Aktion Airport is located 15 km from the city and is continually modernized and expanded. 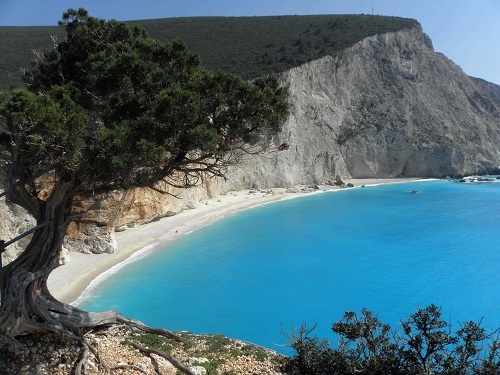 Lefkada is located 385 kilometres from Athens, 180 km from Patras and 100 km from the harbour of Igoumenitsa in Epirus. There are direct charter flights between Lefkada and most European Capitals. You can reach the island of Lefkada by car through a bridge that connects the island to the mainland (free) and the prefecture Central Greece. The blue flags indicate that the sea water is perfectly clean. The sea is perfect for all kind of water sports. On Lefkada you will find two of the best beaches of the Mediterranean to surf: Vassiliki, where very special air flows are and the Agios Giannis village, near the town of Lefkada. Sailors really love Lefkada. Beside all kinds of water sports, there are a lot of opportunities for cycling, boxing, basketball and tennis. The flying club of Lefkada organizes competitions and model glider flying. Via Lefkada town, in the north of the island, there are several places accessible by car, bus or moped. Great holiday resorts on Lefkada are Nidri, Poros, Syvota and Vasiliki. All the fun tourist towns, some a bit bigger, others smaller on Lefkada. Nidri is the busiest and most popular place of the island. Paxos or Paxi. Paxos (and Antipaxos) are two small islands south of Corfu and west of the Greek mainland Epirus. Paxos covers an area of eighteen sq. kilometres and has about two and a half thousand permanent residents. 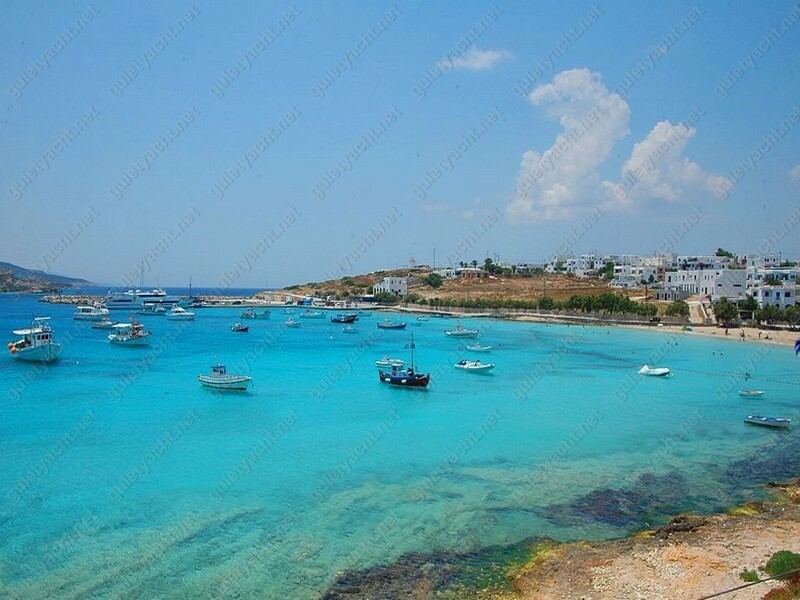 It is a very green island full of olive trees and pines, sea caves, traditional villages and quiet beaches. 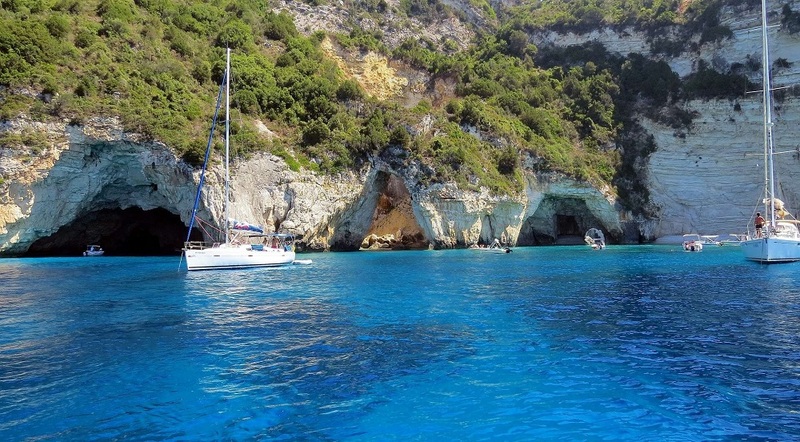 Paxos is located about ten kilometres from Corfu and twelve kilometres from the coast of Epirus. By boat, the island is accessible from various ports of Corfu and Epirus. Paxos has an elongated shape, the west coast is flatter than the east coast. The east coast is very steep with many high cliffs and caves. The eastern part is the most impressive part of the island. 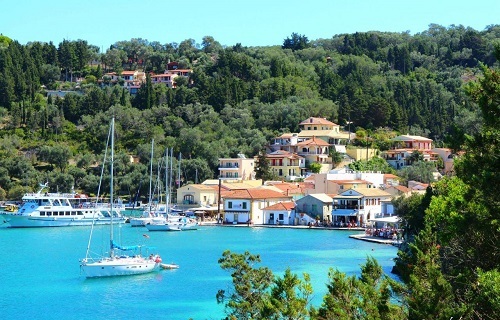 Although Paxos has few inhabitants, it is very crowded in the summer. The international jet set has discovered the island, several rich people or celebrities bought a vacation home here or come here on vacation. The island is in the past visited by Julia Roberts and Pamela Anderson. 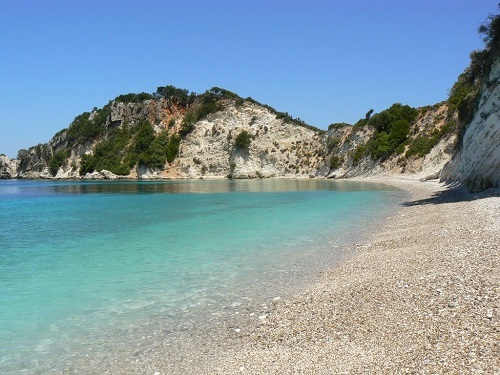 The beaches on Paxos are similar, large or small, they are generally white pebble beaches with clear turquoise water. On the island are many beautiful beaches, these are often not accessible by car but rather by boat. Therefore it is not a bad idea to rent a small boat and sail around the island at your leisure. The length of coastline the entire island is just twenty kilometres, which is so easy to do. Zakynthos. Zakynthos, what a lovely island! 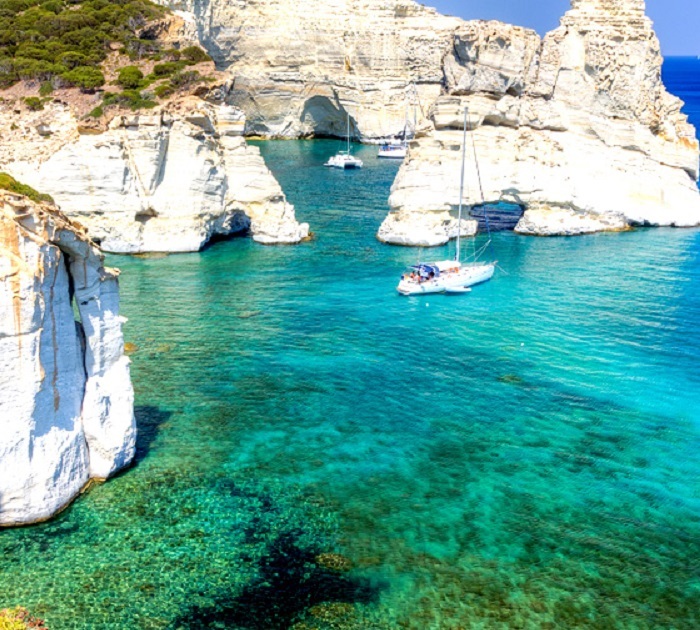 Its green nature, the beautiful clear blue sea with steep rock formations, the amazing sandy beaches, the old villages, the Blue Caves, the ship wreck, the impressive Caretta-Caretta sea turtles. 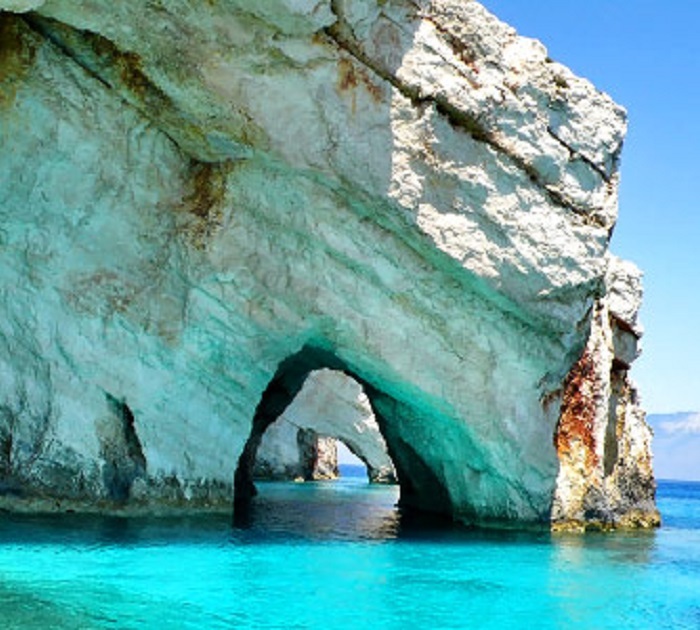 Zakynthos is located in the south of the Ionian Sea and is also called "Zante", a name given to it by the Romans and Venetians, once they for centuries occupied the island. They called the island also "Il Fioro di Levante", meaning "flower of the East". Levante is also called the wind that blows in summer from the east and which cools the places on the East Coast. Zakynthos is the name of the son of Dardanus which "Zakynthos" name. Dardanus was the king of Troy, and he's the first who built the city on the island, according to the myth. Others claim that the name is derived from the flower "Yakinthos" which is common in Zakynthos. According to Homer, the island belonged to the kingdom of Odysseus. Homer called the island "Iliessa" which means forest. Syvota is a village and a former municipality in Thesprotia, Epirus, Greece. Since the 2011 local government reform it is part of the municipality Igoumenitsa, of which it is a municipal unit. The municipal unit has an area of 72.439 km2. The population in 2011 was 875 for the village, and 2,640 for the municipal unit. The seat of the municipality was in Plataria. Today, Syvota town is a well-developed resort, owing largely to the numerous pristine beaches with clear waters located on several islets immediately offshore. 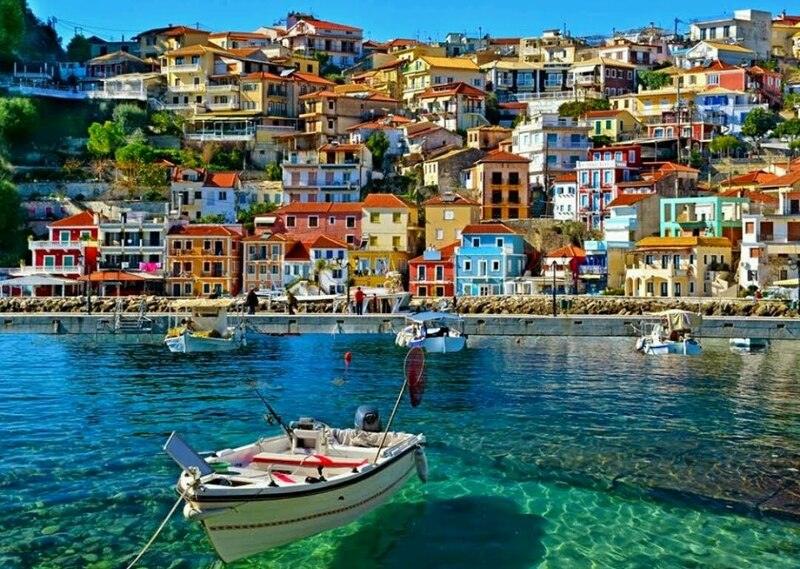 Parga is a town and municipality located in the northwestern part of the regional unit of Preveza in Epirus, northwestern Greece. The seat of the municipality is the village Kanallaki. 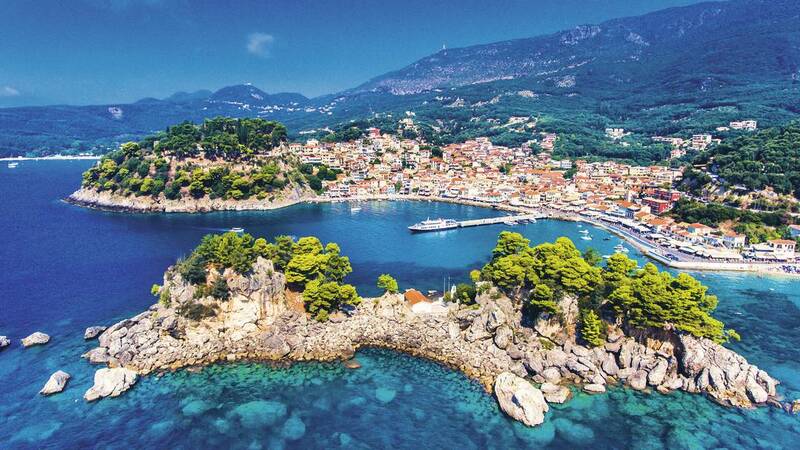 Parga lies on the Ionian coast between the cities of Preveza and Igoumenitsa. It is a resort town known for its natural environment. The Castle is found on the top of a hill overlooking the town and was used to protect the town from the mainland and the sea. It was initially built in the 11th century by the residents of Parga to protect their town from pirates and the Turks. The volcanic activity in ancient years has endowed Milos island with an exciting variety of gorgeous landscapes, consequently offering the visitor a wide range of activities. The funny shapes of the rocks and their wonderful colours at the beautiful white sandy beaches are one expression of the volcanic features of Mílos; the economic activity is another: minerals such as obsidian are excavated here. What is more, one of the most ancient mines in the Mediterranean is on this island. References had been made by Hippocrates to the peculiar morphology of spectacular caves (Papáfragkas and Sykiá) and a multitude of thermal springs (Kanáva, Alykí, Provatá, Pikropiyí).The diving enthusiasts will find a paradise in the underwater caves in the triangle formed by Mílos, Kimolos and Polýegos islands. The island’s villages are lovely too: the stately Pláka (the island’s capital), the harbour of Adámantas, the beautiful Hivadolímni, the marvellous Emporiós with the little lagoon of Revary and the old iron mines. 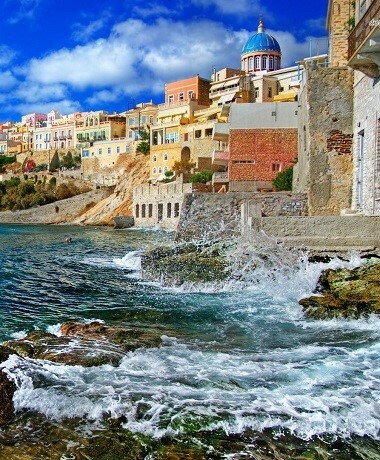 Syros is the island where Greek tradition and western influence come to a harmonious marriage. Ermoúpoli (meaning “the city of Hermes”) is the island’s capital town and has been the first important trade and industrial centre of the country in the 19th century. 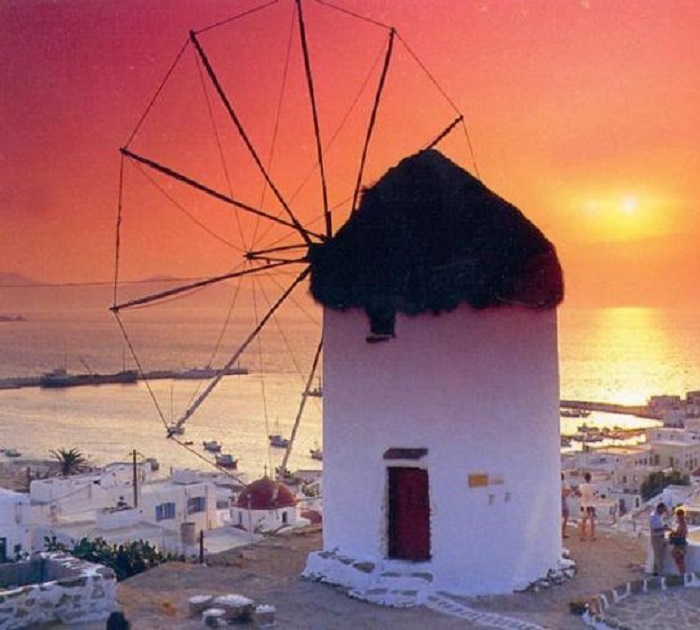 Paros is one of the largest islands of the Cyclades with approx. 120 km coastline, situated about halfway between Athens and Santorini. 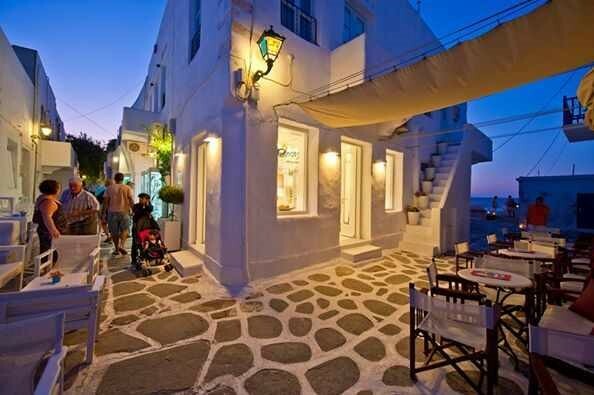 Already in ancient history Paros was famous for its semi-transparent marble, which is still quarried today. Parikia, the capital, is one of the main harbours of the Cyclades. 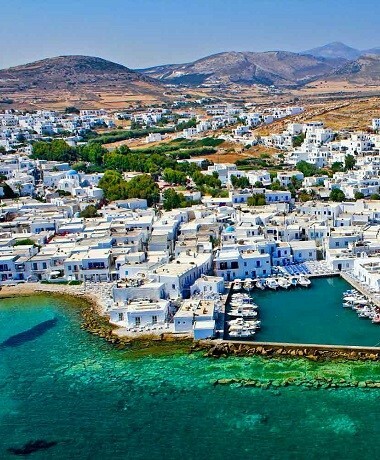 Paros Island has a lot to offer its visitors! Whether you prefer a quiet, peaceful holiday enjoying the beautiful nature and traditional Greek atmosphere, an active or educational one, or you would just like to party, you\ll definitely find what you are looking for! The infrastructure is very good, the main road around the island being about 72 km long and well sign-posted, which makes it ideal to go discovering the island by yourselves! Paros has many beautiful sandy beaches for all tastes. Some are hidden, tiny little bays, enclosed by extraordinarily "sculptured" rocks , others are long and wide. The typical countryside with its gentle, terraced hills and magnificent rock formations, endless vineyards, olive groves and fruit trees is overwhelming. In the spring, the island is completely green, with flowers growing everywhere! Koufonisia is actually a complex of two islands: Pano Koufonissi which is inhabited and has tourist facilities, and Kato Koufonissi which is totally uninhabited and visited only for a beach trip from Pano Koufonissi. Located between Naxos and Amorgos, Koufonisia island is an ideal place to relax. Perfect for walking and cycling, there are many fantastic beaches to visit and many of them are actually nudist places. 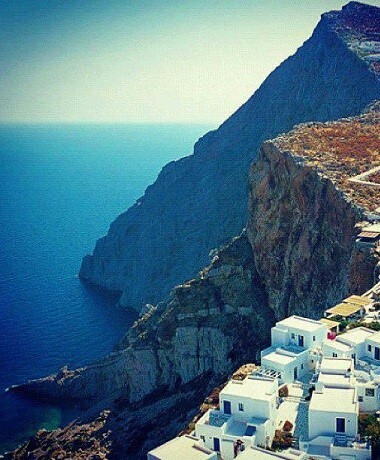 Amorgos is one of the most beautiful Greek islands in the Aegean Sea. Located near Naxos and Ios, on the southern side of the Cyclades, this island amazes visitors with the natural beauty, the traditional architecture and the fabulous beaches. 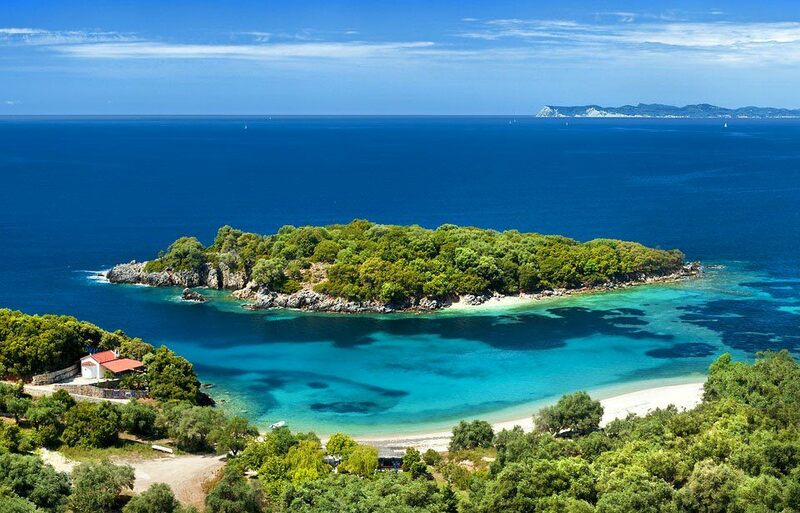 Its virgin beauty inspired the filmmaker Luc Besson to shoot scenes of the movie The Big Blue in the beach of Agia Anna. 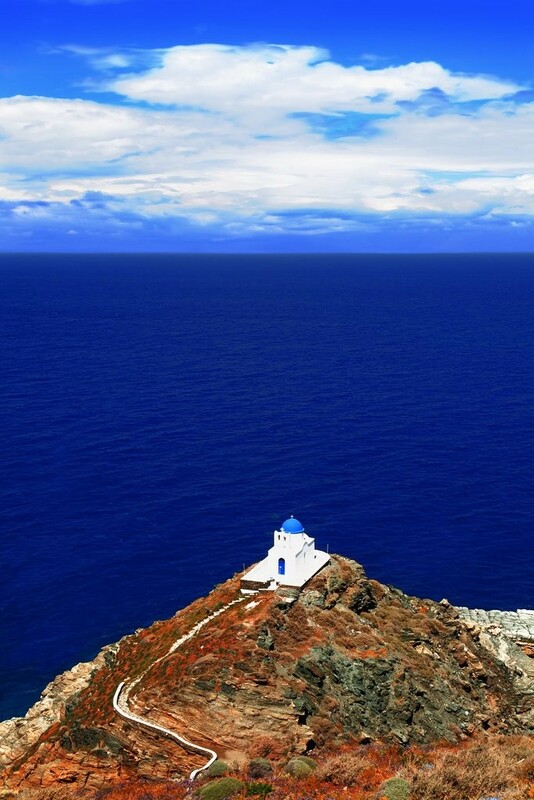 Ios Greece belongs to the Cycladic islands. 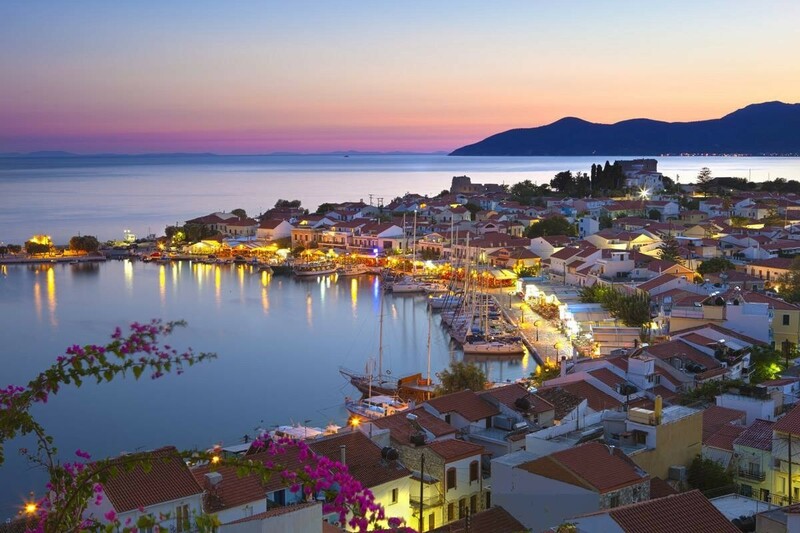 It is particularly famous for the wonderful beaches, the picturesque village of Chora and certainly the intense nightlife that attracts mostly young crowds. Beach parties start in the midday and last till the early hours in Mylopotas, making it a popular place for teenagers and youth. However, this island is not only for partying. It has great places to relax away from large crowds and noise. An island with wild natural beauty, Folegandros in Greece is located between Paros and Santorini. Although it is found close to popular islands of Cyclades, Folegandros island remains away from mass tourism and keeps an authentic character. Sifnos has a dreamlike quality. A string of three whitewashed villages, anchored by the capital Apollonia, sit like pearls along the crest of the island. The changing light kisses the landscape and as you explore the flanking slopes of the central mountains you’ll discover abundant terraced olive groves, almond trees, oleander and aromatic herbs. Each of the island’s bays harbours a spectrum of aqua waters, and offers breathtaking vistas. 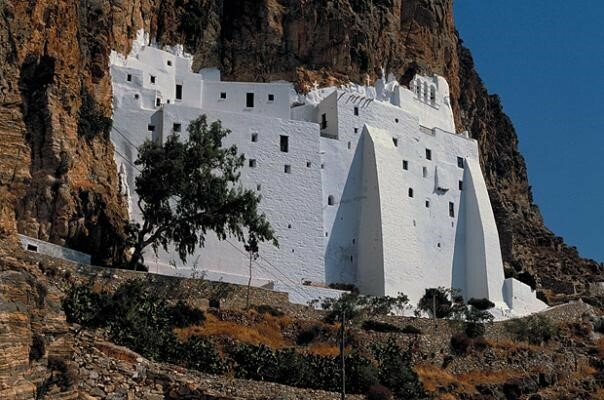 Serifos is a beautiful island of Western Cyclades, in a short ferry ride from Athens. 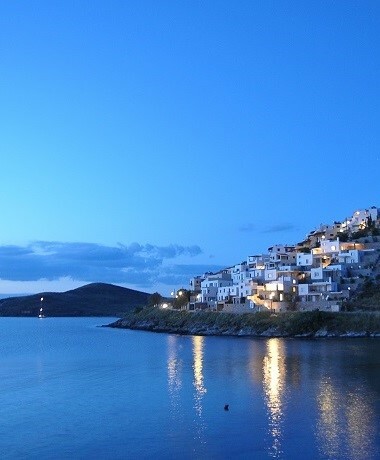 Not much developed in tourism, Serifos island has kept its traditional character and the virgin landscape. Chora is the most picturesque spot in Serifos Greece, constructed on the slopes of a mountain and with fabulous view to the Aegean Sea. The most tourist places are Livadi and Livadakia, while the island has crystal beaches all around its coastline. Ideal for families or romantic couples, many trekking paths also cross the island, providing interesting landscape to explore. 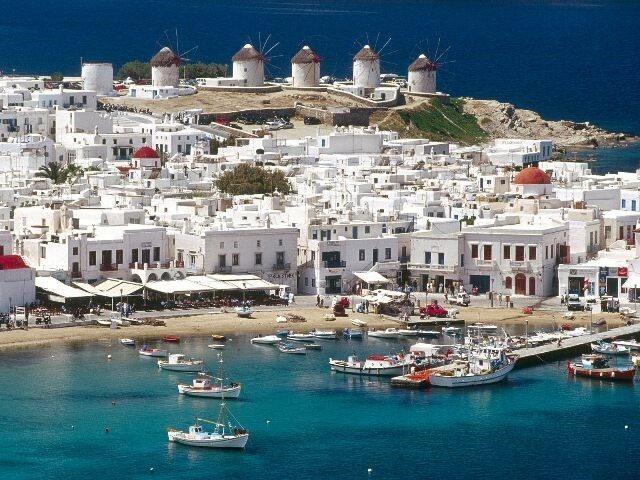 Kythnos is a beautiful mountainous island located in the western part of the Cyclades. The wild beauty, the picturesque architecture and the lovely beaches attract many visitors, particularly Athenians in summer weekends. 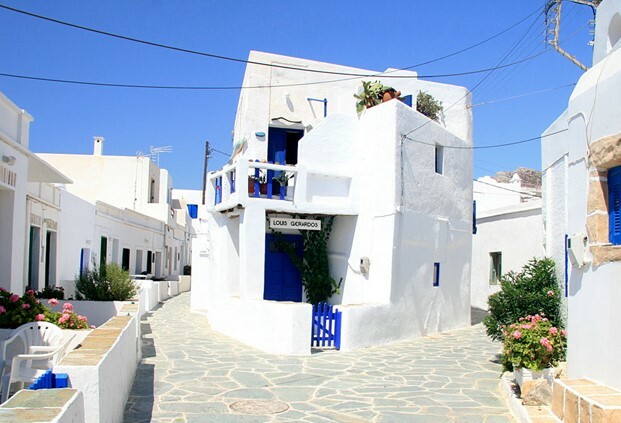 Chora and Driopida are the most traditional villages in Kythnos island with stone houses and paved streets, while Loutra and Merihas have many tourist facilities. Kolona is the most beautiful beach on the island, with soft sand and crystal water. 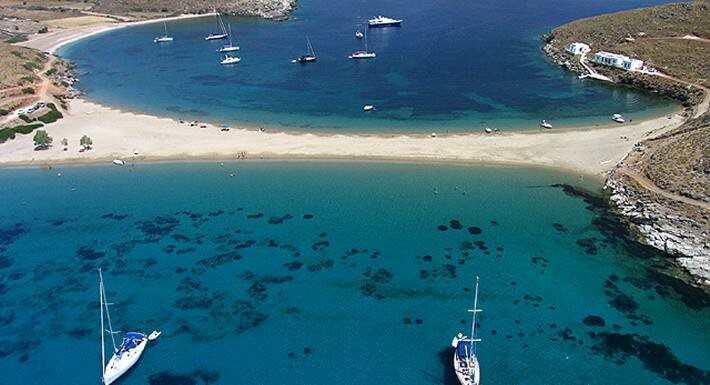 The rest of the beaches on Kythnos Greece are secluded and ideal for relaxation. Lavrio is a small town in the southeastern part of Attica, about 60 km SE of Athens, rich in cultural heritage from ancient to modern Greece.The port of Lavrion is changing faster than any town in Greece, opening tavernas, cafes and becoming an important ferry boat hub for the Cyclades Islands and home port for several cruise ships and sailboats. 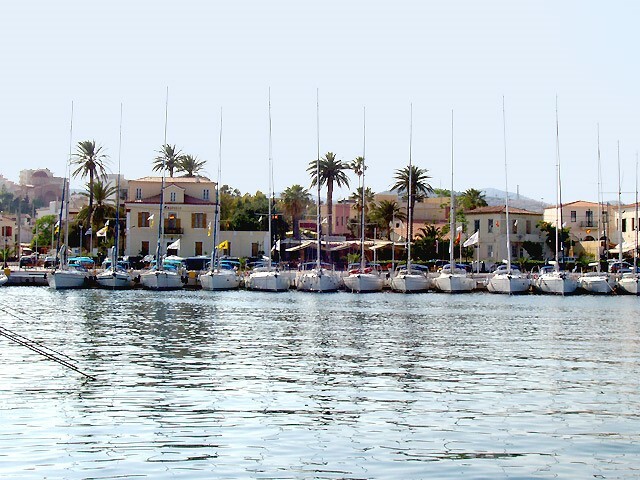 Sailing Clubs hosted on port, have made Lavrion known throughout the world while organizing sailing competitions of international level in order to promote water sports. 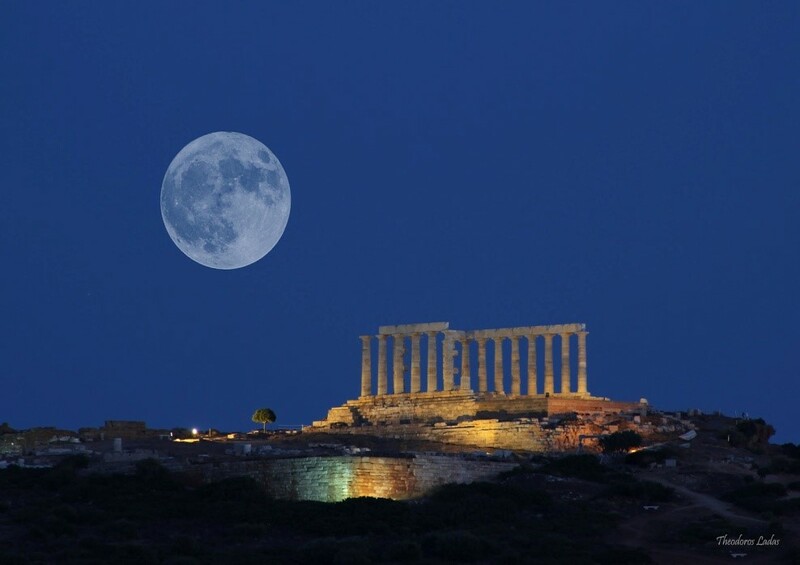 The temple of Poseidon, the ancient Greek god of the sea, dominates the southernmost tip of Attica, where the horizon meets the Aegean Sea. Perched on the craggy rocks of Cape Sounio, the temple is enveloped in myth and historic facts dated from antiquity until the present times. 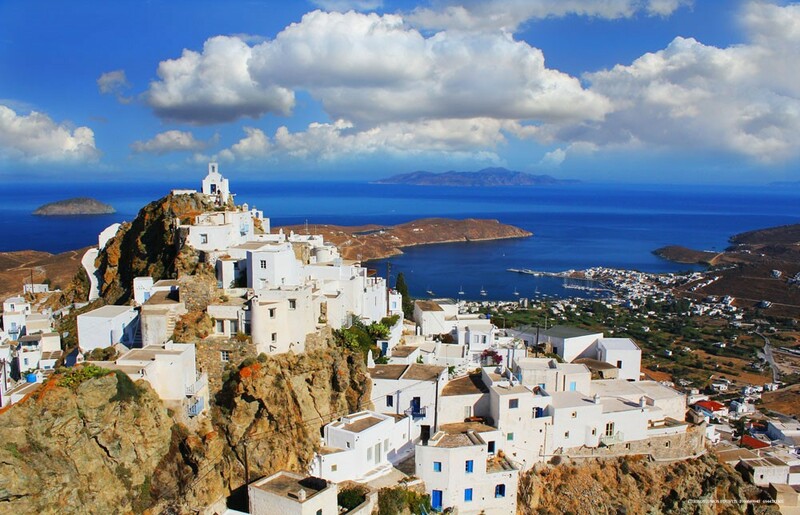 Due to its proximity to Attica, Kea is an easily accessible beauty with a scenery variety: steep mountains, small fields, olive groves, vineyards, valleys, picturesque coves and off-the-beaten-track beaches. On the island with the largest oak forest in the Cyclades, bird-watching is a real delight. Copyright © 2015 m/s Erato - Powered by st4th1s.